So, are you a bona fide expert overeasy egg cook now? If not, you should check out the last Egg School entry on cooking and perfecting overeasy eggs. Don't know what Egg School is? Check out my Egg School primer from several weeks ago. But if you are in the dark, you're gonna have some serious catching up to do because below is the much anticipated next Egg School entry, detailing all the best tips I know for making poached eggs. Plus, there are pictures! 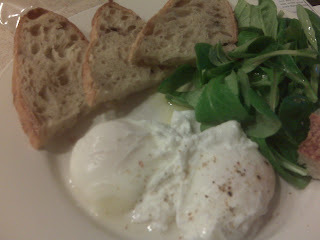 Did I mention that poached eggs are my favorite type of eggs? Well maybe it's overeasy. It switches back and forth a lot. The truth is, a good soft poached egg should be similar to a good overeasy egg -- both with delicate, soft whites with a thick, runny yolk. Poached eggs are even more delicate than overeasy and possibly more difficult to make. They are also a rare breed. Many "eggs-any-style" offerings' asterisk will be "except poached," yet the places will turn out the very same poached egg drenched in hideous hollandaise as a Benedict. They can charge more and don't have to make the poached eggs look as pretty underneath all of that butter and oil. Because it is pretty hard to make a good poached egg and have it look pretty. Well actually, no it isn't! Follow my instructions below and quit shrinking at the thought of poaching. For poached eggs, you first need to put water on high to boil in a pot or pan. If its a pan, be sure that it's deep enough to have at least a couple inches of water (i.e. the eggs need to be submerged later). However, you don't want the eggs to touch much while they're cooking, so the more eggs you are making at once, the more surface area your cooking device should have. Thus, a deep pan is usually the ideal cooking apparatus. But it needs to have a lid! 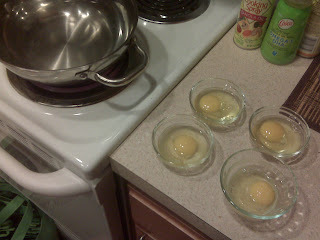 While the water boils, you need to crack each of your eggs into its own little cup or dish that is somewhat heat safe. Like a little glass bowl. Doesn't this dirty a lot of dishes? Yes, but it is crucial in my opinion to uniform cooking and a smooth process. They need to be all ready in a line by the time the water boils. 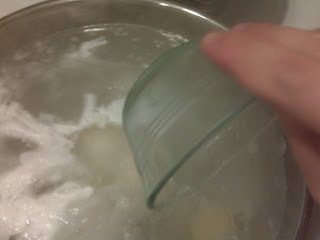 At that time, you should, in quick succession, put a pinch of salt in the water to retard boiling, put a glug of white vinegar in the water to help the whites to solidify and then quickly yet carefully tip each egg into the water at about surface level. You can even put the lip of the little dish into the water to make the tipping as smooth and gentle as possible. Try to aim the tipping so that each egg has its own little area of the water in which to cook. Now immediately put the lid on and turn the heat completely off but leave the pan on the burner. Finally, set the kitchen timer for two minutes and thirty seconds for a soft yolk with firm yet delicate whites. For harder yolks, leave the eggs in the water up to four minutes. Do not touch a thing from the time the eggs go in the water until the timer goes off. Just trust the process. When the timer does go off, use a slotted spoon or spatula to remove each egg from the water carefully, draining as much water as you can through the slots, and then placing on your nearby plate. You are officially done with your poached eggs! They will be a delight to eat right away, with just about anything -- they just look, taste and feel like delicacies. But they are not completely easy to make and require a little practice. Less technique than overeasies, and more process and patience, but there are few who will not be absolutely thrilled to receive a perfectly poached egg from you.